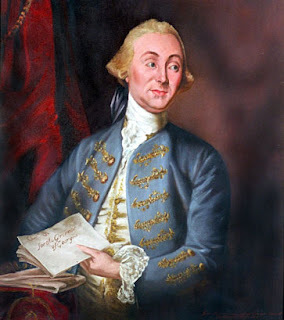 James Wright (May 8, 1716 – November 20, 1785) was an American colonial lawyer and jurist who was the last British Royal Governor of the Province of Georgia. He was the only Royal Governor of the Thirteen Colonies to regain control of his colony during the American Revolutionary War. James Wright was born in London to Robert Wright. In 1730 his father accompanied Robert Johnson to the Province of South Carolina and was, for many years, the chief magistrate of that colony. James followed soon after and began the practice of law in Charleston. He also began amassing plantation lands. Wright returned to London as an agent for the South Carolina colony in 1757. Then, in May 1760, he was named as Lieutenant Governor to Henry Ellis in Georgia. He returned to America and took up residence in Savannah, Georgia. When Ellis resigned he was appointed Governor in November 1760. He was the third, and arguably most popular Royal Governor of the colony. He sold many of his holdings in South Carolina, acquired land in Georgia, and moved his financial operations as well. With peace temporarily established with the French and Spanish, he successfully negotiated with the Indians and the Crown to open new lands to development. In his early administration, the new lands and economic improvement fostered the development of the Georgia colony. His first troubles came with the Stamp Act of 1765. But, in spite of efforts by the Sons of Liberty to block its implementation, Georgia was the only colony to import and actually use the revenue stamps. As the American Revolution gathered momentum, Georgia remained the most loyal colony. This was due in part to its recent settlement, since many residents had direct roots and ties with Great Britain, and, in part, to his able administration. Georgia did not even send delegates to the First Continental Congress in 1774. By 1775, the revolutionary spirit had reached Georgia through the Committees of Correspondence and he dismissed the assembly. But a revolutionary congress met that summer in Savannah and elected delegates to the Second Continental Congress. Then, in early 1776, following the arrival of a small British fleet, rebel forces entered his home and briefly took him prisoner. Wright escaped on February 11, 1776 to the safety of the HMS Scarborough, and sent a letter to his council. The congress and the Council adjourned without answering him. For a time, Wright continued negotiations. He was even able to trade with the rebels to keep his offshore troops and ships supplied. But the differences continued to escalate. When his attempt to retake Savannah with naval forces failed, he returned to England. By 1778, Governor Wright convinced the government to lend him enough troops to once again attempt to take Savannah. After some short but sharp fights, he regained control of Savannah on December 29, 1778. While never fully in control of the state, he did restore large areas within Georgia to colonial rule, making this the only colony that was regained by the British once they had been expelled. He led a successful defense against several American and French attempts to capture the city. When the war was lost, he withdrew on July 11, 1782 and retired to England. Wright's extensive properties were seized by the revolutionary governments in South Carolina and Georgia. He died in London, and is interred at Westminster Abbey.